Starting with ume (Japanese plum) in February, Mother Nature starts unrolling a carpet of texture and color that Japan follows madly along until collapsing with exhaustion in the heat and humidity of summer. Ume are followed by the beloved sakura, and then the scene rapidly becomes more crowded with blooms of all shapes, sizes, and colors. 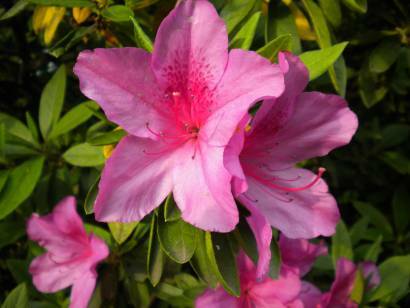 Roses, wisteria, and hydrangea are but a few, but at this moment it is the native azalea that holds center stage with its bright pink or white flowers. Usually arrayed along streets and sidewalks here in Tokyo they migrated down from the mountainsides over the centuries to participate in festivals and weave themselves into a series of complex traditions. Trimmed up boxy they make a fantastic hedge that remains green throughout the year as well as a nice little hideout for urban wildlife. Stopping by from A Diva's Garden. I'm a big fan of Azaleas too. I have several pink and red blooming now. A welcome sign of spring in the states! Thanks for stopping by! I don't think I was ever aware of them before moving here, I confess. Now, they're a seasonal favorite. The azaleas are blooming here now (upstate New York). Sadly, we've had a lot of rain in the last week and haven't been able to enjoy them. We never got to enjoy our lilacs, either. The rain finally stopped and the flowers are rotting. Glad you are having better luck than us. Bookworm, your lilac comment makes me sad. I was lucky enough to see them here for the first time this year, and buried my face in the blooms for nearly five solid minutes. It was such a pleasure. I'm glad you've got the azaleas, at least! May your next favorite flower bloom bountifully and you get to enjoy it, to boot!